I have not used all of these apps yet, so I will save the review of each for later. The information about each app is copied from the app developer’s description, just FYI. So, that said this is a list of must have iPhone and iPod apps for artists. There are over 75,000 apps in the iTunes store so it is likely that I have left out some gems. If you know of a great one that I missed, please leave a comment with a link to it. Price: $4.99 - Brushes is the iPod app that was used to create the cover for the June 1, 2009 cover of the New York Times. Price: $19 - CameraBag recreates the magic of film in a fast, intuitive, minimal interface: choose a photo, choose a filter, and you’re done. Digital cameras have replaced film for all but the most die-hard photographers, but something was lost in that transition. Before the digital era, a photographer’s choice of camera and film had nearly as much artistic impact as the subject matter. Rediscover the fading, tinting, blurring, chemical processing techniques, and “happy accidents” which gave film photos life. Price: $0.99 - iCreated brings the coolest, iPhone-centric Art on Earth to the App Store. Why settle for boring wallpapers, when you can enjoy the efforts of international artists who use their iPhones to create ART. Over 100 original pieces create a visual link between iPhone Art, and iPhone Apps. Price: FREE - iFolio is an iPhone/iPod application designed to display portfolios of Photographers, Painters and Illustrators. iFolio lets you discover other artists and share your work with others. If you are interested in a specific image, you can contact the artist using the « Send » button. As you discover artists who’s works you enjoy you can use the « Favorite » button to mark them for easy finding later on. Using this feature will also increase the number of fans an artist has and will influence their listing in the « Top » list sorted by user popularity. NEW: Displays the artists based on entry date to the app. This will hopefully assist you in discovering new artists. MODIF: Artists are sorted by the date they modify or add to their profiles. This will help you identify new images added by the artist. CACHE: This list makes it so you can view the iFolio of the artist again later without an internet connection. Artists who are iFolio artists can manage and change their portfolios at any moment. Make sure to use the iFolio application often to keep up with the latest images submitted by your favorite artists. In order to view the freshest images, use the « Modif » button at the top of the app. You can also try to find a specific artist using the Search feature at the bottom of the app. Searches are based on the artist’s name. Images can be viewed by rotating your iPhone/iPod to view in both portrait and landscape. Images can be viewed using a slideshow with the ability to alter the time between images displayed. You can also import all information regarding an artist and consult them later without the need for an internet connection. If you wish to set this as a global setting you can set the « Progressive Download » option under the Settings menu to disabled. Price: $4.99 - Layers allows you to add up to five layers to each drawing, opening a whole new creative space. You can add a layer from a photo to trace your subject, or use the eraser tool to remove parts of one layer and reveal details of the layer beneath! A full-featured eraser gives you fine grained control over layer transparency, and a smudge tool allows for tons of unique painting styles! Want to add photos to your drawings? Layers allows you to position and scale the photos you add and see how they’ll appear on top of your existing work. Once you’re done painting, you can email your drawing as a PSD file with the layers intact. Price: $9.99 - The Panorama app features fully automated photo stitching. All you need to do is to take the photos, which need to be only roughly aligned. The app then automatically accurately aligns adjacent photos, applies brightness/exposure differences corrections, seamlessly blends unlimited photos into a single panorama. The stitching method is a mixture of latest image processing techniques and our own innovations. It is unique in its quality and you won’t find it anywhere else. Price: $2.99 - Photogene is about improving your digital photos while having fun at it. This intuitive, easy to use application offers a comprehensive set of professional editing tools. Enhance photos with multiple color adjustment options and a sharpen filter. Add fun effects like text balloons, frames or special filters. Price: $2.99 - Sketchbook Mobilex is the FREE lite version. 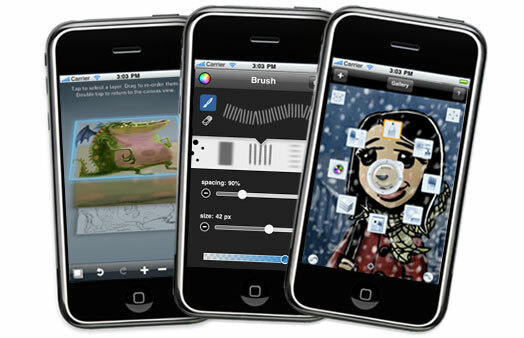 SketchBook Mobile offers professional-grade painting and drawing tools in a streamlined and intuitive user interface. Use it to digitally capture your ideas as napkin sketches or produce artwork on-the-go.